Well, I did it. Baubles and Brunch was a big success without walloping my wallet. In fact, I had TOO much food — likely because my mom took me to Costco to prepare for the party, and I got excited. Something about buying in bulk is SO appealing. I feel like I’m getting away with murder (almost), when in fact, I’m only getting away with 4 lbs. of sausage. Thank God I don’t have a membership, or I’d really be in trouble. Girls don’t eat. I made enough food to give everyone seconds, which means I made too much food. I sent most people home with doggie bags for husbands, boyfriends, and roommates to enjoy. The ladies who brunch refrain from over-imbibing on Sundays. I bought 5 bottles of champagne and a gallon and a half of OJ. We only drank 2 bottles of the champagne, and half the OJ. People had coffee too, but not that many. I could definitely have dialed back the champagne purchase and saved cash. Sausage-egg muffins are my new go-to. These were so easy. Easy to make, easy to eat. I did learn that paper liners help make the experience seamless. The recipe says you can bake without them, but I think it would be hard to be successful. The pear cake looked like I bought it (which is a good thing). Everyone was so impressed that I made it! It looked beautiful. The recipe would also be good with apples. I think I’m going to try that this weekend. Total purchases made by guests: $1400+ (hello, S&D credit)! 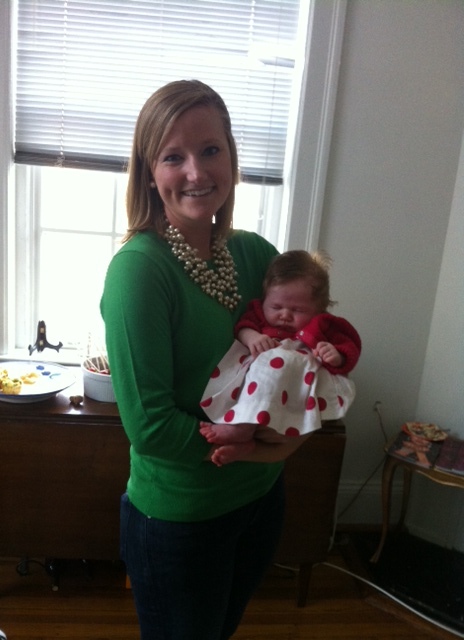 Below is a picture of our youngest guest, Eleanor, in her adorable polka dot party dress. You can see she’s kind of nonplussed – this picture was taken just after she found out that the S&D pearl bib necklace I’m wearing is being retired. She was really annoyed. Bonus, “Santa” (read: mom) came, and I’m happy to say that some of my favorites from my previous post will be waiting under the tree for me in December! Shameless plug: the online store for the party is still open – in case anyone wants to make a purchase. Next stop, hosting my annual Christmas cocktail party without breaking the bank. 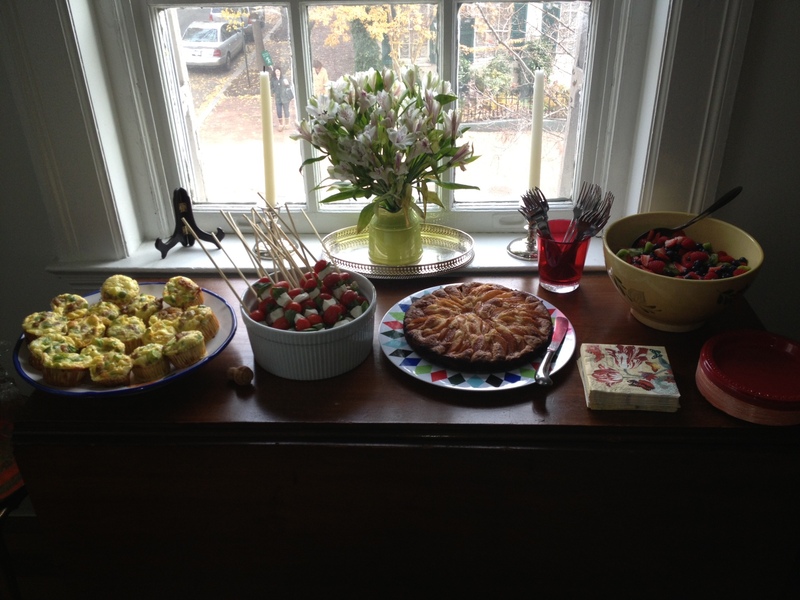 Baubles and Brunch was my minor league debut – the Christmas party marks my entrance into the big leagues. So great!!! I love reading this!! I can’t wait to hear about how your Christmas soriee goes! Great suggestion! Thanks for sending it along. I am definitely going to try it out!